Are you looking for unique New Year’s Resolution ideas? 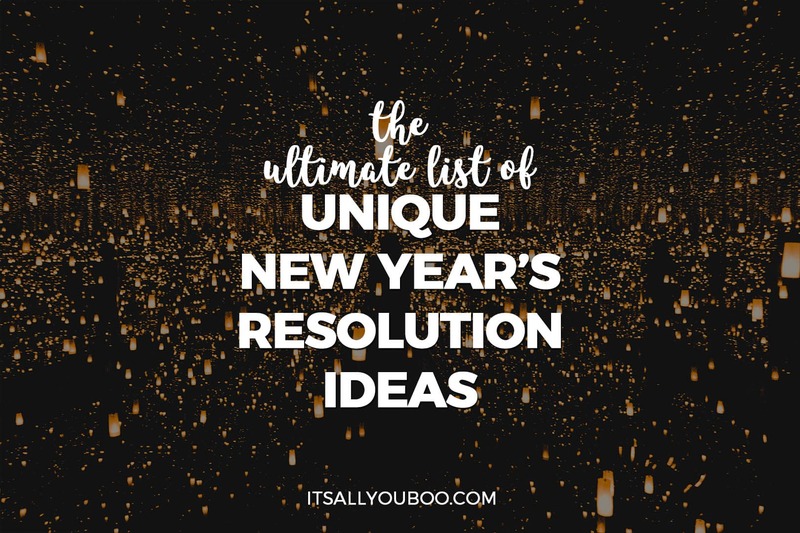 Want the ultimate New Year’s Resolution list for 2019? As the New Year approaches, we all start thinking about the lives we wish we had. Thinking about things we’d like to change and the steps we’d like to take towards living our best life. Your first step to making 2019 your best year yet, is to choose the right New Year’s Resolution for you! You could choose one of the most common New Year’s Resolutions, like eating healthier, getting more exercise and saving more money. I encourage you to go deeper and to set a unique New Year’s Resolution for you! With ten possible areas of your life to focus on next year, you have the chance to choose a new year’s goal that’s just right for you! That actually matters and gets to the heart of what you want most. 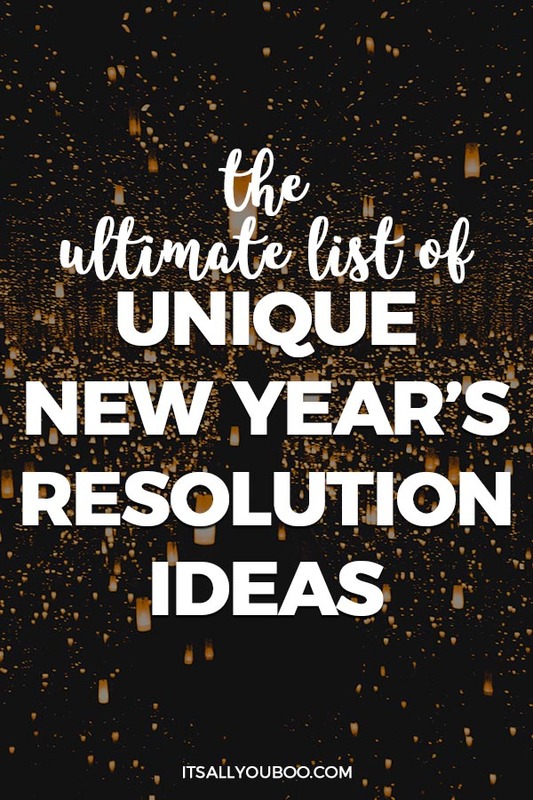 Here are over 100 unique New Year’s resolution ideas for every area of your life to help you achieve your dream and goals this year! How’s your health and how you are feeling physically? Have you been making healthy lifestyle excuses? To focus on your body and physical health in 2019, consider New Years Resolution ideas that address what you eat and drink, your sleeping habits, the physical activities you do, your level of fitness and how well you care for your body and your health. You can reach your health and fitness goals this year! Do your emotions drive or drown you? How’s your emotional wellness? 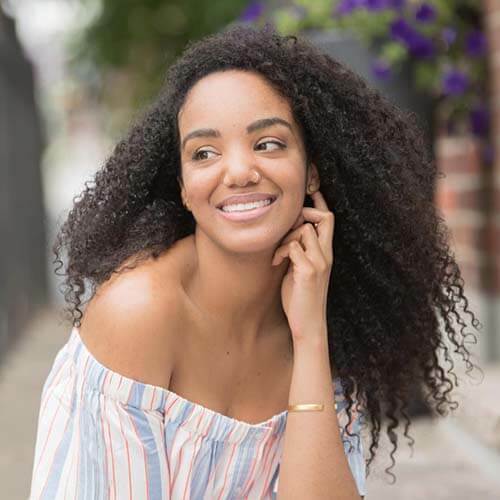 To focus on your emotions and feelings in 2019, think of unique New Year’s Resolution ideas that address your emotional maturity and awareness, how you embrace or ignore your emotions and how these emotions affect your behavior. Increase your emotional intelligence (EQ), i.e. your empathy, impulses, how you express emotions and so on. Take the EQ Test here. How’s your mind and mental life right now? Is your mind clear and focused, or chaotic and scattered? To focus on your mind, memory and thought life in 2019, consider these New Year’s Resolution ideas for your internal thought life, from the nature of thoughts and how you process information to your mental capacity, problem-solving abilities and the engagement of your mind. Are you still learning new things? Do you feel engaged and like you’re still growing? In order to focus on your educational life in 2019, consider these New Year’s Resolution ideas for continuing your learning and expanding your knowledge, from formal institutions, online courses, reading books or even from on-the-job or real-world experience. What have you always wanted to do? How can you improve your everyday life? Consider that life is all about experiences, good, boring or bad, from amazing adventures, traumatic events, and even the day-to-day. Is your career stagnant? What’s the next move you can take or have always wanted to take? Consider whether you’re valued and appreciated at work if you’re accomplishing your professional goals, the quality of your work environment and the opportunities available to you. What does your spending say about you? What do you need to earn or save to meet your financial goals? Consider not just how much you’re worth or have in the bank, but also your possessions as they’re tied to your finances and can be assets or liabilities to your bottom line. Where do you belong? How can you get involved? How can you get to know your community better? Consider that your community is whatever you would define it as, it can be your city, neighborhood, school or place of work. It can also be online or in-person. Is there a type of relationship you hope to develop? Consider the quality of your relationships with family, friends, partners, and colleagues, as well as how you can improve or invest in them. How can you deepen this connection? Are you at peace? Do you need to become more spiritual? Consider that something greater is defined as you see it: God, heaven, the universe, cosmic energy, the environment, mother nature, and so on. It’s however, you see yourself inside or in relation to something greater. What Should My New Year’s Resolution Be? So many New Year’s Resolution ideas, how do you choose? 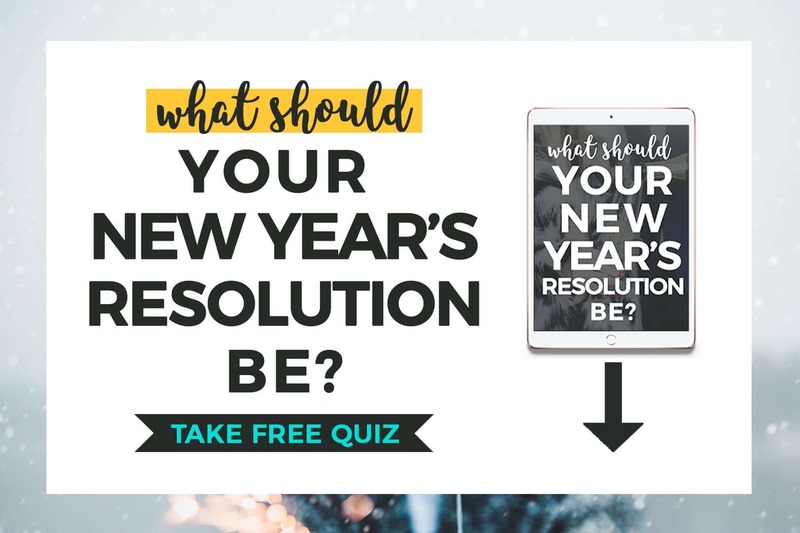 Take the New Year’s Resolution Quiz to discover what area of your life you should focus on. What’s your unique New Year’s Resolution idea? This was so inspiring to read! Even though I’ve been pretty good and consistent physically (meaning I never missed a work out and ate clean) I really need to improve my mental health and personal realationships. Let’s make this year the best one yet! So glad that’s inspired you! I’m the same way, but for me, my physical body ain’t doing do great, I really need to work out. I find it’s about choosing the right ones for the right time in our lives. OMG! Nadalie, your blog came just in time. I don’t make resolutions, but I do set yearly goals. The difference, of course, is setting goals comes with a plan to achieve those goals. So, thank you so much. This gives me a great starting point. I’m sooo happy that you found it just at the right time! Yearly goals are great, no matter what you call them the intention is what matters. These are all great, forward-moving and thinking resolutions to keep in the New Year! I generally sit on sprucing up the financial and physical, but I never considered improving my communal or relational life! I’ll take that into consideration, for sure. Right, me too. I used to always think about those super common resolutions like “get healthy” or “make more money,” but when I really sat down and created this 10 areas of your life breakdown, I realized. There is so much more to our lives that we can work on. These are really great ideas.I like that you have detailed each idea which is really helpful.I am focusing more on education and professional life in the coming New Year! Woot – so glad you noticed, I really tried to give more than just a few words for each possible resolution idea. That’s a great area to focus on! Best of luck in 2018! These are all amazing ideas to move my life into a better 2018. I will definitely be jotting some of these down. I think the hardest thing is removing myself from social media while I am blogging. That does make things very difficult. Aren’t they though? I find myself revisiting this list just as I sort out my priorities for 2018. I know the struggle, I really try to just turn notifications off and only have certain times for checking in. I think my main focus in 2018 will be the spiritual and financial goals. I’d like to be more stable and accomplished in both those areas right now. Overall though, I feel blessed to be where I am right now. Happy New Year! That’s a well-balanced choice! Stability in both can really ground you. Nothing beats feeling satisfied and grateful for where you are now. Now is great! Hahah, don’t feel guilty, get motivated! You got this! Love Your List! I think it’s important to turn those resolutions into SMART Goals. It’s easy to say I want to lose weight… Heck we all wish we could lose weight but setting a goal with a deadline is gives you more drive. I so agree with you! Making resolutions should always just be our FIRST step, making the achievable and SMART helps make it a reality. I know I always need a deadline to get anything done. I’m thorough if nothing else. lol. I really wanted there to be something here for everyone no matter what their focus is or life is like. These are all great New Years Resolution ideas. It gives me a smart starting point to make my Years Resolutions. Hope it gives you a head start too! Happy 2018! I have been working in the area of my physical life for the last 1 year or so. I am satisfied the other areas. My goal is to have a healthy lifestyle.I like the idea of a detox. Detoxing is a great way to start the year. My mom has been telling me to do it even before it became a fad. So many great ideas on this list! Love how you have a table of contents, too! Right! We really have so many options and do not need to pick the classic 5. Glad you enjoyed the post, I love a good table of contents. Very well written. Very helpful, thank you. I’m really glad you have tons of options for everyone. I am a young person looking for ways to improve in my fitness and in my emotional wellbeing and this really helped me choose my goal. Here’s to drinking more water and to daily gratitude!